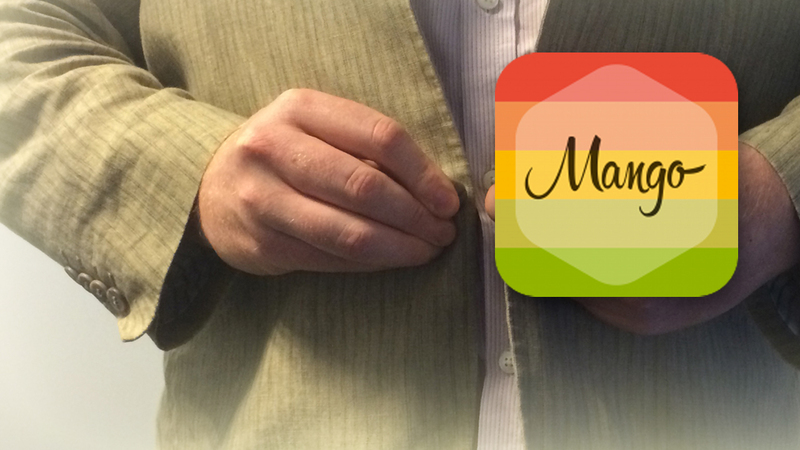 Last week I set out to begin a new lifestyle of healthy diet and exercise with the aid of apps. 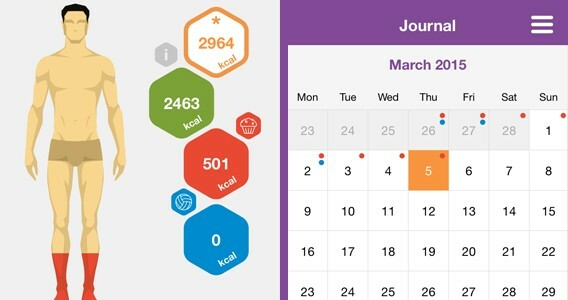 My first choice for dietary aid is Mango – Calories Counter & Diet Tracker. My selection method for this first app was rigorous, by which I mean it was the first diet app I saw in the Lifestyle section of the App Store. Day one with Mango was a bit of an eye opener, as it asked me for my vital statistics. The whole process was nice and straightforward thanks to the clean and colorful interface: age 35, height 194 cm (6’4”)… nothing new there. Right, weight – I have some scales somewhere. 125 kg (275 lb)! When did that happen? Just four years ago I was 90 kg (198 lb). I suppose trading a life as a kindergarten teacher for a desk job was going to take its toll, but that is nearly a whole other person that I’m carrying around. The upshot of my horror was that Mango decided I should be able to consume nearly 3500 calories a day to maintain my weight. This baffled me, as I am certain I currently eat less than this, but who am I to argue? However, as my aim is to slim down, so I set a target weight of 85kg (it’s good to dream) and Mango decided that it would take me 50 weeks of eating 2964 calories a day to reach my goal. That’s a lot by the way, 2500 is the average for a man – but I figured it would at least be easy to stick to. Despite my doubts about how successful this “diet” would be, my first impression of Mango was strong. Five tabs at the base of the screen gave me access to my profile, exercise input, consumption, tracking of my day so far, and a calendar of my time with the app. Most of my time was to be spent on the food entry pages, as it turns out I consume a lot when you include coffee. It felt constant, but somehow I never seemed to cross the magic 2964 calorie limit. Or so I think, because my biggest issue with Mango is that it demands you know the weight of everything. This isn’t just a problem when eating out. Just take my lunch time routine, I tend to make a large stew (or similar) on Sunday which I portion and freeze for the rest of the week. Even if I measured everything I added to the pot, I would still be left approximating the individual ingredients in any given meal – a painstaking and inaccurate task. It was an issue that persisted for the whole week. Every item I added food or drink, the measurement started at 100g, leaving me to dial it to (or guess) the right measurement. All of this is done through use of a slider, but it feels infuriatingly fiddly. For example I take sugar in my coffee, no real idea how much but let’s say 6g, so I have to dial it back 100g (imagine 100g of sugar in your coffee) to five then use a button to fine-tune it up a gram. It is all just a little too… scientific. It needs natural measures (cups or spoons) or at least a default its measure that could be considered a standard portion. Exercise is tracked in a similar fashion, but somehow feels more rounded. Each choice has estimates for the calories burned for each minute of an exercise. 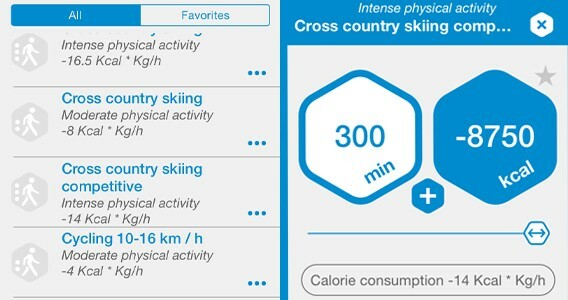 For instance, Mango predicts that a nice 3 km/hour walk will use 2.5 cal/min, while competitive cross country skiing burns a whopping 14 cal/min. Unfortunately, Mango doesn’t seem to adjust to your body size, and I am pretty sure my 125 kg frame running burns more than it did when it was 90 kg. All of my data was tracked on a single main page in a mesh of stylish hexagons alongside a nice illustration of a character that filled with red as I used my day’s calories. 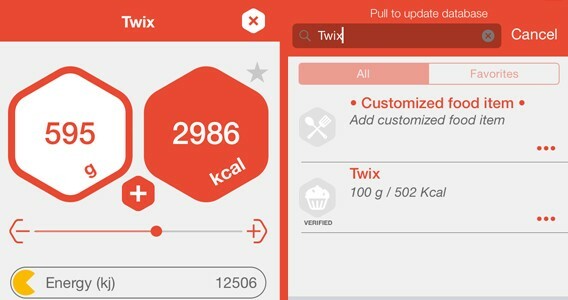 This screen also gives access to a nutritional breakdown of day’s food but never offers any advice to improve diet – meaning if I wanted to I could just eat 600g of Twix a day. 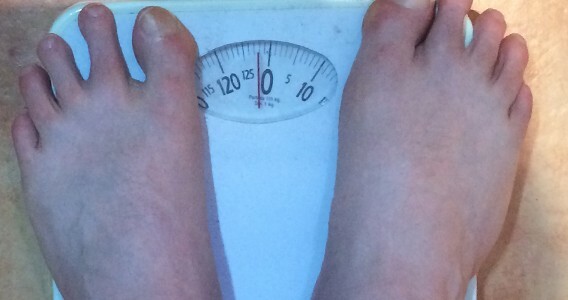 I spent a week adhering to Mango calorific limits and was expecting to see some effect as I stepped back on to the scales – especially as the first week of dieting is usually the most impactful. Not this time, however, as my scales told me that, if anything, I had gained a little weight. So it seems that, even with careful monitoring of my eating habits and my regular use of the Daily Yoga app, I have become no healthier this week… hopefully my next two weeks with MyPlate will prove more successful.